Imagine what life would be like if Thomas Edison had met competition when he invented the light bulb. We might be using three different kinds of house-hold lights. Of course the Edison bulb wouldn't work with the Ferguson lamp, and the Ferguson lamp wouldn't work with the Davidson socket. Stores would stock three of everything. There would be fierce discussions between light enthusiasts on which lamp system was best And every consumer would wonder if the lamp he bought would be the one to grow obsolete. Far-fetched? Perhaps. Silly? Of course. So why are videodisc manufacturers doing exactly the same thing? protected by an outer jacket and is removed from this caddy only when inside the machine. Even the smallest amount of dirt, oil from fingertips, or scratch can severely degrade the video image. Video and stereo-audio information is recorded in micropits, small pore-like depressions in the surface of the disc. In the manufacturing process, a laser beam is split in two; one beam is used to record video and audio information, the other to record tracking pulses. The modulated beams are then focused on a photo-sensitized glass master. Developing the master produces an intricate spiral of etched pits from the outside inward. An intermediate stamper is made from the master and the discs you buy are pressed from the stamper. How is the stylus guided on the record if VHD uses no grooves? Small tracking pits are recorded along with and in between the spiral of picture and sound information. As the disc plays, the flat diamond stylus senses the placement of these tracking pits and adjusts its position accordingly. The pickup arm that holds the stylus is mounted on a carriage which slowly inches the needle across the disc. The stylus arm can move forward or backward, left to right, to correct for small variations in turntable speed from disc slippage or from some disc eccentricity. Microprocessor-based circuits sense the fluctuations to ensure proper playback and time base, helping to eliminate problems of shifting colors and horizontal "tearing." One of the biggest selling points of the grooveless design is that the stylus' greater surface - contact area-I 0 times that of the CED stylus - enables it to last longer than the needle in a CED player. 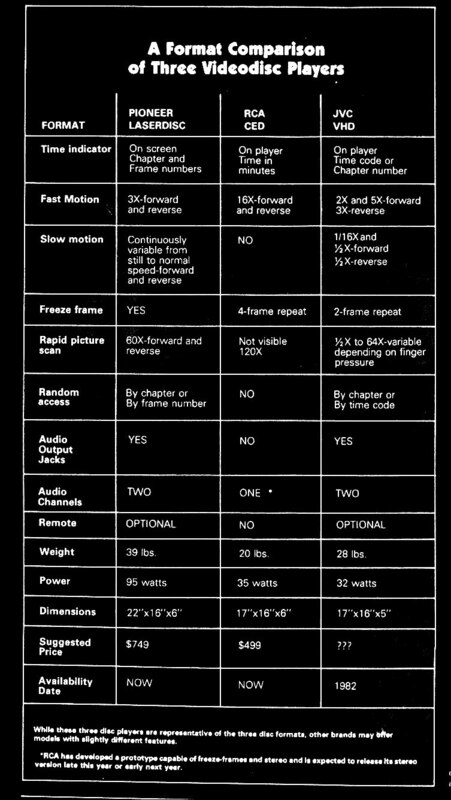 JVC estimates about 2000 hours of stylus life and 10,000 hours of disc life; RCA's estimates are about half that. 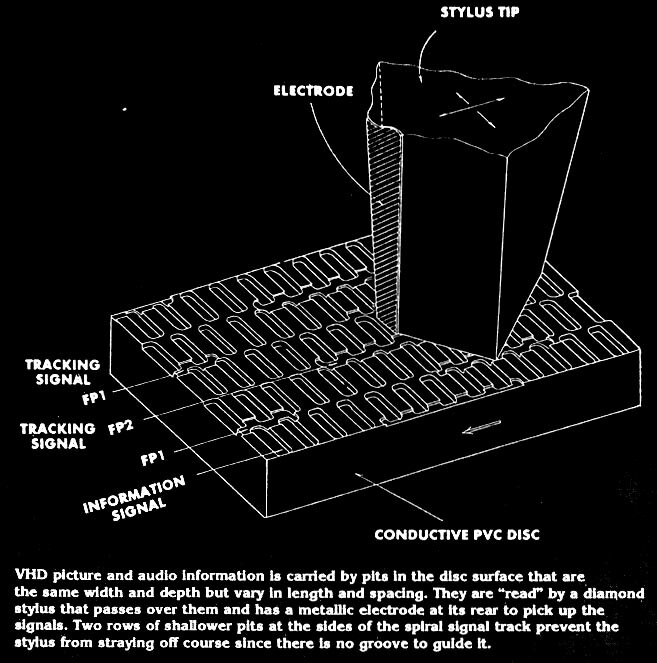 VHD and CED discs use a capacitance-pickup technique to retrieve information. Both discs are distilled from a mixture of polyvinyl chloride (PVC) plastics. During manufacture, small specks of carbon are added to increase electrical conductivity. The disc itself and a small metal sliver called an "electrode," which is bonded to the stylus, make up a standard electronic component known as a "capacitor." A capacitor takes an electrical charge and releases that charge at a stable and predictable rate. For the capacitor to work there must be a small gap between the two materials; in this case, the micropits create air space between the stylus and disc surface. 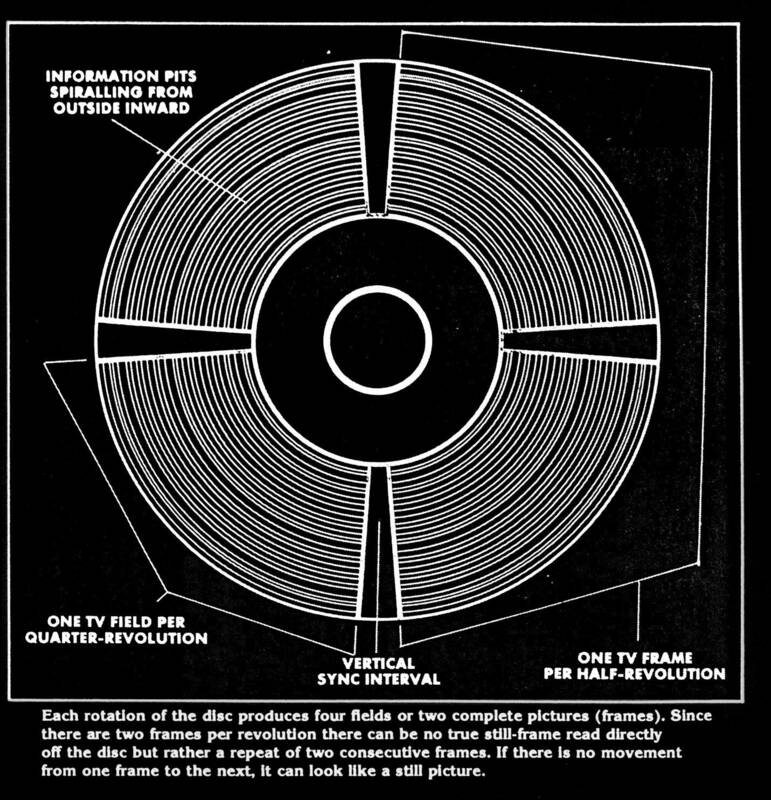 The pits on a VHD disc are recorded all at the same depth and width. But each pit has a different length. Shorter pits produce high-frequency signals (bright images); longer ones produce low-frequency signals (dark images). 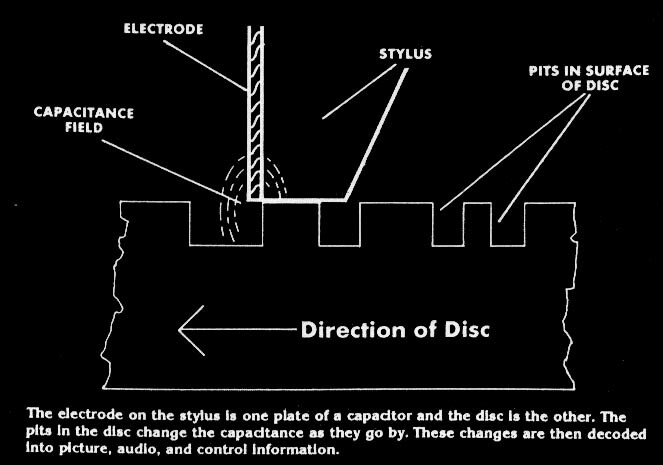 The electrode on the stylus reads the constant capacitance value of the disc, but also senses the length of each pit This "duty cycle modulation" makes possible the transformation of complex video and audio signals into a viewable picture. Three practical speed choices are open to the disc manufacturer using the NTSC format: 1800, 900, and 450 rpm. Each has its own advantages and disadvantages. The first creates a crisper picture because the higher the revolution rate, the better the signal-to-noise ratio. However, a fast speed leads to short programming. Also, problems from warped or off-center discs are more pronounced at higher speeds. The "standard play" LV discs turn at 1800 rpm. Four-hundred-fifty revolutions per minute produces longer play time and hides disc defects quite well. But it also sacrifices picture quality. RCA chose this speed for its CED discs. the VHD disc is smaller than the CED and turns faster, play time is identical for both. Each revolution of the disc equals two television frame~30 frames per second. For certain special effects such as freeze frame the player repeats the same two frames. It's not possible (now, anyway) to view one frame, but the difference in action between two frames is often negligible. Because LV discs are engineered for one revolution per frame, they are capable of single-frame freezes. However, special effects are possible only on standard-play discs. No Extended-Play discs - the ones with an hour per side - can perform any special functions. Though the VHD grooveless-disc system uses a contact pickup like that of RCA's CED, it's capable of all the special effects an LV disc can perform. That leads to some interesting possibilities. The VHD player can do Manual Searching using a seesaw button control. Rapid Visual Search plays an entire side of the disc in less than 60 seconds (the best thing about it: you get to watch). Each second of search time equals roughly one minute of program. The machine searches in forward or reverse. A slower Visual Search works at 2X and 5X speed and, again, in both directions. Unlike CED, VHD can do slow searching. It works at 1/16th and 1/2 normal speed in forward motion and 1/12 normal speed in reverse. VHD discs can be viewed at normal speed (thank goodness! ), both forward and backward. In reverse, the disc doesn't change directions; the stylus plays two frames for one revolution, skips back, plays the next two frames, skips back, and so forth. VHD is well-suited for interactive video. Each disc side can hold up to 10 "chapters" or program segments that can be accessed by punching in the proper chapter code. LV discs are also compatible for interactive programming, though CED lacks the required program-manipulation features. RCA claims these features are possible, but CED's grooved design and other factors (such as revolution speed) prevent a visually acceptable and economically practical solution. Besides, RCA is leaning toward entertainment and leaving instructional and how-to programs to the other manufacturers. 54,000 possible program choices, or 54,000 pages of written information, or 54,000 maps, or (fill in the blank). All VHD players have dropout compensators to prevent the loss of signal that results in heavy black lines across the screen. The stylus also has a cutting edge to shear bumps and specks of dirt from the disc surface. Any remaining gap on the disc creates a dropout usually so short in duration that it's barely perceptible. VHD players have stereo sound for discs so recorded. Outputs on the rear of the machine provide for both RF and phono-jack connection for easy hookup to any stereo. According to VHD's backers, more than 30 percent of their programming will be musical material to use the stereo capability to full advantage. Dual audio channels also provide for bilingual instructional or educational programming. Schools and institutions located in multi-language areas need buy only one disc. Both languages in a bilingual program, English and Spanish, say-would be available on the same disc. A foreign film could have both dubbed English and its original soundtrack Unlike the other disc systems, VHD is capable of Pulse Code Modulation (PCM) sound playback. 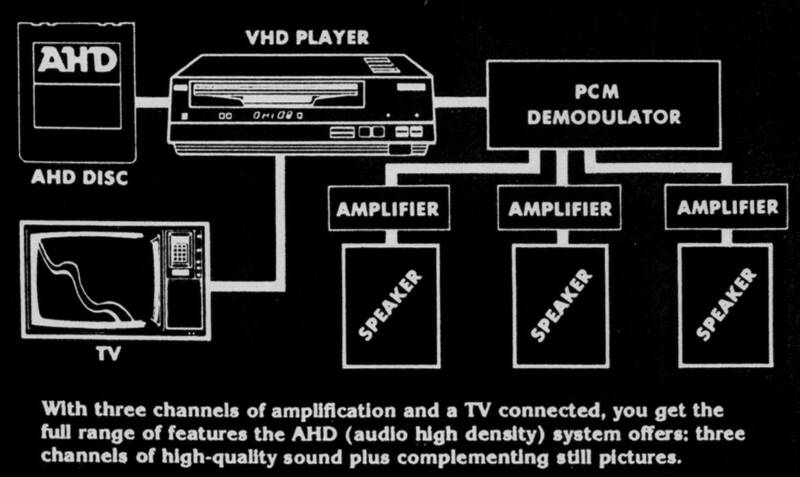 With the proper electronic adapter (about $500), PCM can transform the videodisc player into a high-quality multi-channel audio-disc system. What about costs? At this writing none of the manufacturers, including JVC, GE, Panasonic, Quasar and Sharp, would reveal exact figures. 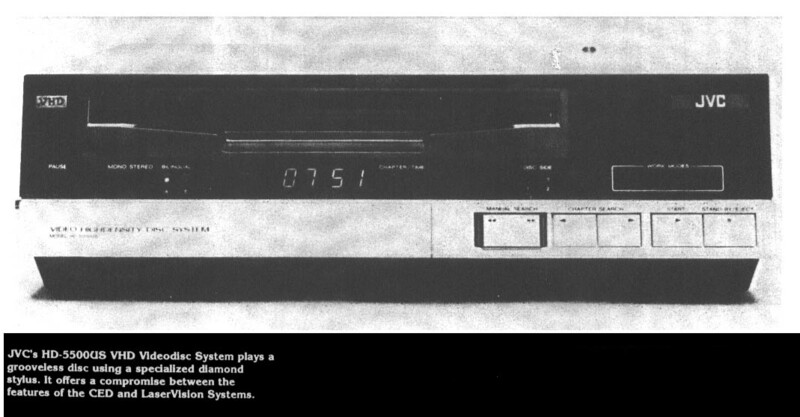 But several sources think it will be competitive with the new stereo CED units. In any case, the price of the player should not be over $600. What's a disc player without programming? Especially since you can't record with a disc system. Initially there will be only 75 VHD titles when players hit the American market in June 1982. What's more, the VHD Disc Manufacturing Company, responsible for making the discs, went into full production just last month (October). It has a lot of catching up to do if it hopes to get enough discs to the 4000 dealers it's currently setting up. On the other hand, the disc industry is still in its infancy, so VHD's late arrival may not be as detrimental as it may appear. Consumers are demonstrating a keener awareness of both program availability and machine performance than they did with videotape. The time lag may be in VHD's favor since VHD can counter dealer and consumer apathy more effectively. licensing many titles to VHD. (Interestingly, MCA is a partner in DiscoVision Associates, the LV-disc manufacturer.) A list of Universal films to be available has not been released, but features might include Coal Miner's Daughter, Animal House, The Sting, Jaws, and other favorites. Video releases of musicals such as Jesus Christ Superstar and Xanadu should benefit from VHD's stereo capability. United Artists recently endorsed VHD and will make all of its titles available, including Raging Bull, Rocky, La Cage Aux Folles, the "Pink Panther" series, and Fiddler on the Roof United Artists also owns the rights to pre-1949 Warner Bros. classics including Key Largo and Little Caesar. The VHD catalog will also include programming from other areas of the arts - heater, dance, pop music-along with sports, therapeutic, and religious programs. A total of 250 titles are slated for the catalog by the end of 1982.
own programs. However, the cost of mastering and pressing videodiscs is much higher than the cost of duplicating videocassettes. Distributors of specialized and adult programs might not see their names on videodiscs for some time. Moreover, VHD insists on buying back the majority of custom-pressed discs so that VHD discs will be available only at stores carrying its players. Eventually, VHD claims, programming will be available separately as audio records and prerecorded videotapes are now sold. All disc-player and disc manufacturers look to this goal. It's likely that the new "video library" concept of tape rental will quickly expand to include discs. Even at an average retail price of $23 to $25, many consumers may choose to rent a film for a night or two rather than buy it. Thomas Edison had it easy.